Get a unique sky library with 25 hi-res files taken exclusively for this issue, enjoy 66 minutes of live-action how-to videos and editing tutorials, and much more. 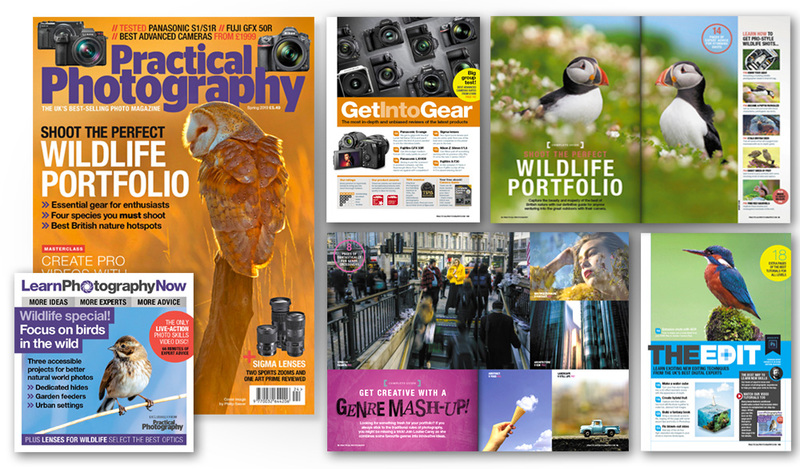 Get your animal photo fix with 14 pages of expert advice for shooting the UK’s four most accessible species, plus discover Britain’s best 31 top spots for seeing deer, red squirrels, puffins and birds of prey. Unleash your inner anarchist with seven rule-breaking projects that combine multiple genres, from street vs fashion to architecture vs ICM and beyond. Daniel Sands is a Dorset-based landscape enthusiast who loves to experiment with innovative new techniques. Here he shares his experiences and discusses his love for the abstract. Rising travel and nature star Elisabeth Brentano uses her powerful imagery to raise awareness of the wildlife and environments being left behind by the modern world. The world’s weirdest cameras, focal length vs depth-of-field, studio flash, film for beginners, buying a second flash, and many more of your questions answered. Take to the skies with this Mary Poppins-inspired camera-and-editing project that’s positively supercalifragilisticexpialidocious. All you need is an umbrella and some stepladders. This month’s editing projects include making a 3D water cube, growing hybrid fruit, bringing a fantasy book to life, and using Adobe Camera Raw to realise your RAWs’ full potential. In the penultimate part of our popular how-to series, we take a closer look at your camera’s video features and the settings that will help you start creating professional-quality video clips. Take a first look at Panasonic’s full-frame S1 and S1R, Fujifilm’s medium-format GFX 50R, Sigma’s trio of new lenses, and the ten best advanced camera bodies from £1999. Buy the new issue here and get free 1st class P&P, subscribe here, and download from the App Store and Google Play.